If you are noticing problems, it might be time to restore or rebuild your deck. Should you be worried about restoring your deck this spring? Now that the weather outside is not longer frightful and the fire inside has died down, it’s time to move your extracurricular activities outdoors and enjoy your hardscaping and landscaping. 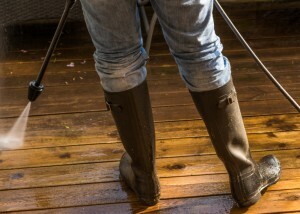 If the seasons have not been kind to your wood deck and you are noticing any deck rotting, it might be time to restore or rebuild this spring. Should you be worried about restoring your deck this spring? Restoration is an increasingly-popular alternative to completely redoing a deck and it’s a great way to extend the longevity of your outdoor living space. Restoration costs much less than totally replacing a wood deck, and refinishing can totally transform the look of your deck without putting much of a dent in your wallet. Restoration is also eco-friendly, since you won’t be purchasing new building materials like you need to to construct a deck from scratch. Restoration chemicals can also be environmentally friendly. What Are Signs that Your Deck Needs Restoration?